ollecting and using data systematically is the best way to ensure resources are used responsibly in public health interventions. This is the core message from IMA World Health nutritionist Generose Mulokozi, PhD, who joined a panel of other experts for a discussion about how evidence can drive nutritional programming. “When we build programs based on limited evidence, we run the risk of misusing resources designed to improve population health,” Mulokozi said. The discussion was a mid-week highlight of the Social and Behavior Change Communication Summit 2018, a gathering of more than 1,000 experts in using communication to influence behavior. The annual conference meets this year in Bali, Indonesia. Mulokozi shared the experience of IMA World Health’s ASTUTE team, which implements the UKAid program aimed at improving nutritional behaviors in the Lakes region of Tanzania. She told a room full of colleagues a thorough review of literature and consideration of optimal practices were the first steps in evidence-based programming. 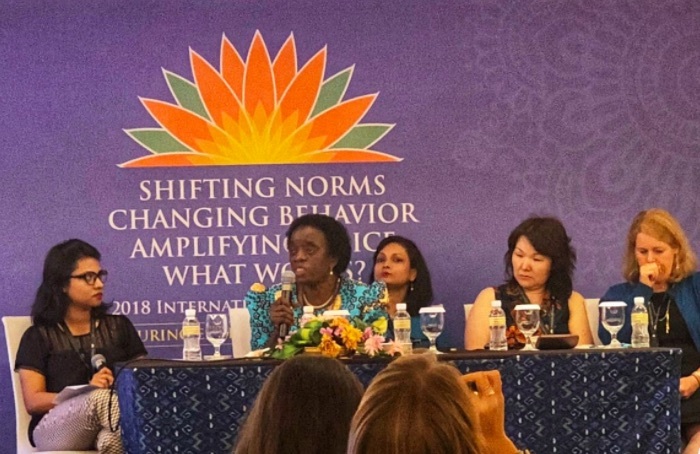 Generose Mulokozi, PhD addressing the audience in a panel at the 2018 Social and Behavior Change Communication Summit in Bali, Indonesia. Photo by Ahmad Syafiq. Identifying supports and barriers to best practices, collecting context-specific data, reviewing literature and securing government involvement rounded out Mulokozi’s advice. As part of a research collaboration with Brigham Young University, Universitas Indonesia and IMA World Health secured presentations for seven abstracts at the SBCC Summit. IMA has extensive experience implementing nutrition-based behavior change programs in Indonesia and Tanzania.